As part of our ongoing celebration of "National Craft Month" we continue with guest posts on the subject of Art vs Craft. 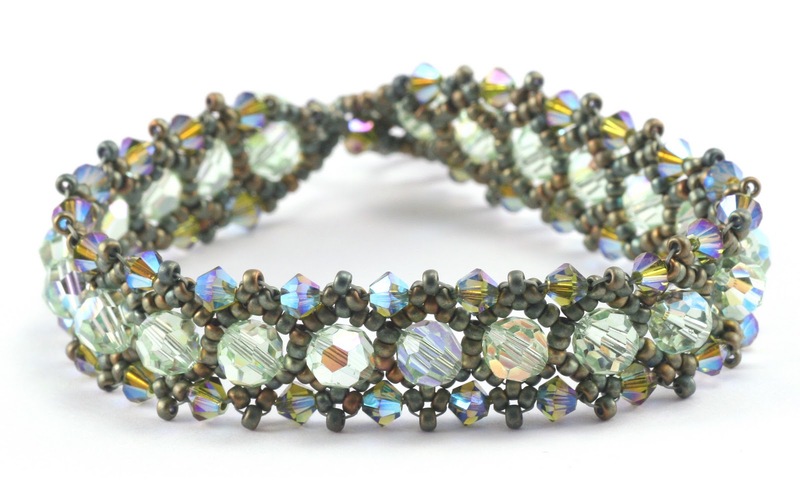 We invited upcoming Beaducation instructor, Seed Bead Queen, and proprietress of Tapestry Beads, Jill Wiseman, to share her thoughts. If you search Google on the phrase "art vs. craft" you will get an amazing 303,000 results. Clearly this is a well-entrenched debate within the art and craft communities, and people tend to have strong opinions on the topic. You can look up official definitions for the terms "art" and "craft", "crafter" and "artist." You can argue the merits of subtle distinctions. But really - can't we all get along? Why does it matter? Jill's popular "Night at the Opera" bracelet. Art through the medium of seed beads. I personally take the stance that the two terms coexist quite peacefully and compliment one another. Let me explain. It took me the longest time to start describing what I do for a living as "I'm an artist." When I first started beadweaving some 10 years ago, I considered myself as someone with a hobby. I took classes, recreated the projects that were designed by others, and started building a set of skills. Now I look back and realize that these years were, in effect, my apprenticeship! Learning at the feet of those who had gone before me and developing the tools that would further my journey into the craft of beadweaving. It takes time and effort to absorb the techniques and stitches, to figure out the best way to hold a piece as you stitch, to discover your own personal preference in materials like bead types, thread and needle options. 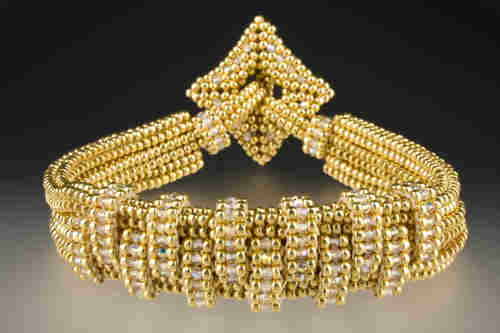 All of this knowledge base is necessary for you to be able to finely craft a beadweaving project. To me, the craft is the care with which you create the project - whether it is your own design or not. What about the term art? For me, that comes from YOU valuing what you make as art. Just because you may be a beginner doesn't lessen the fact that what you're producing is art. We call finger paintings by our toddlers art. Why would we not respect the beauty of a jewelry project the same way? When you are proud of your results and present them with confidence and joy, you are an artisan. A craftsman. A beader. An apprentice. A learner. It's art, and it's craft. Embrace it all. now what is a beader to do? spraying krylon only lengthens the time before the gold paint is rubbed off.